Serbia made a promise and kept it. 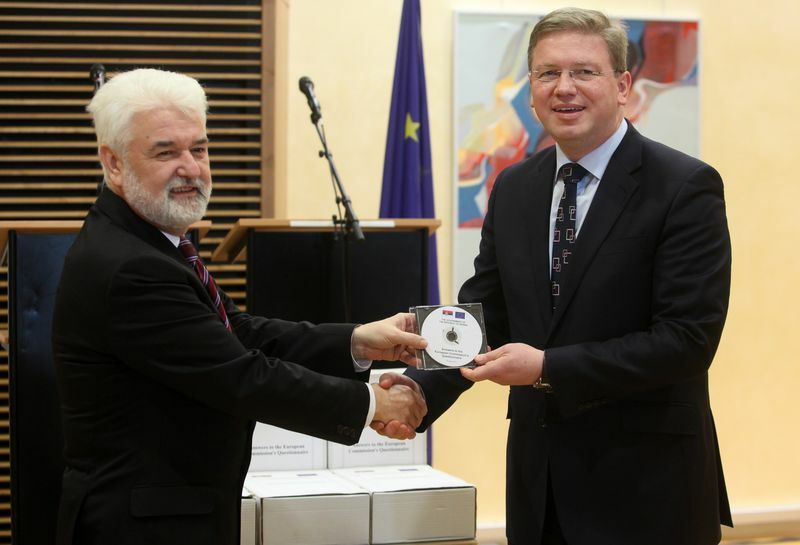 In just 45 days the country managed to give answers to as much as 2,483 questions, handed by the European Commission at the end of last November and on Monday Serbian Prime Minister Mirko Cvetkovic delivered the replies to the questions in the Commission's questionnaire to EU commissioner Stefan Fule. They were gathered in 37 volumes with a total weight of ten kilograms. Now, according to Cvetkovic, who is usually scant in making such statements, Serbia has to solve the problems, pointed by the European Union, if it wants to get a candidate status by the end of the year. In his words, there were two processes that Serbia was facing: the completion of the replies to the questionnaire and further implementation of the reforms in line with the action plan, prepared by the government. According to Cvetkovic this means most of all a wrap-up of the judiciary reform, the adoption of a new electoral law, as well as new property law. Besides, Serbia will have to improve its cooperation with the ICTY in Hague, seen as a main hindrance on its way towards EU membership. The EU commissioner, on his part, used the chance to remind the Serbian authorities that more efforts were needed in the fields of legislation, fight against corruption and organised crime, as well as that the country’s electoral system should be changed. In order to make a double check, an EU experts’ mission is expected to visit Serbia, while the Commission itself might send additional questions, after examining the answers in the questionnaire. Commissioner Fule himself will visit Belgrade in March to measure the progress in the areas, which the government has set as priority ones in connection with is future membership. The Belgrade-based daily Blic sums up all written above in just two sentences: “If the country wants to obtain a candidate status by the end of the year, Serbia has by June at the latest to do all the things it has been promising in the last ten years, that is most of all to pick a property restitution model, to thoroughly change its electoral model, to enable control on political parties financing and to stop mishandling in state-run companies, as well introducing clear rules in public procurements. 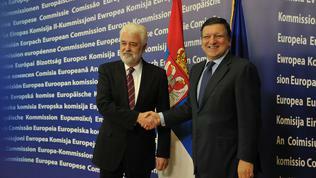 And above all, to meet the renowned “Hague condition” and make a good start of the dialogue with Pristina". Meanwhile, Croatia, which has entered the final stage of its membership path, fears that Serbia might hinder this last stage of the accession negotiations. 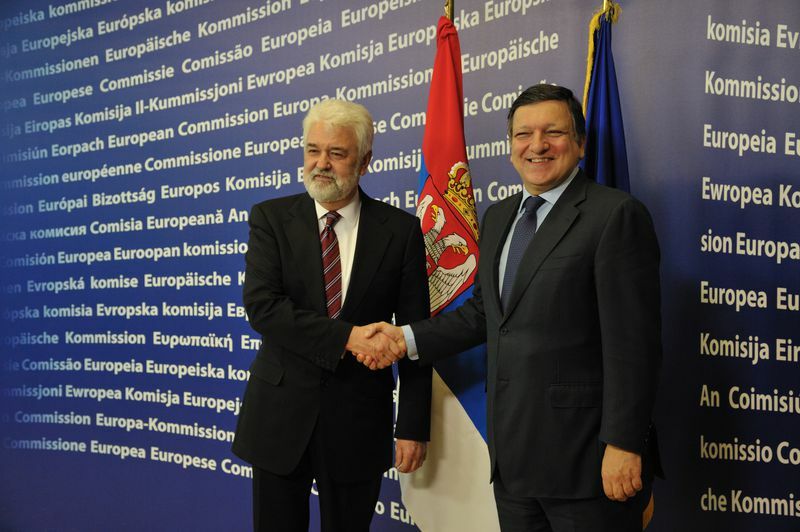 Earlier this week, the Zagreb-based daily Jutarnji List quoted unnamed sources as saying that Belgrade insisted that the EU put pressure on Croatia until all bilateral issues between the two countries were settled. The daily quotes a statement, made by Serbia's Deputy Prime Minister Bozidar Djelic in the European Parliament, where he hinted that Serbia wanted to settle its disputes with Croatia, especially the border issue on the Danube river, to be arranged before the country’s entry in the EU. According to Jutarnji list, more and more MEPs were in favour of the idea that all states in the region should settle their disputes before joining the EU so that not to force the EU to solve them. The Croats had an experience with neighbouring Slovenia, which vetoed any further progress in Croatia's accession negotiations because of a dispute over their joint Adriatic sea border in the Bay of Piran.